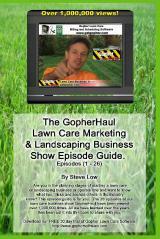 « Dealing with lawn care customers that don’t want contracts. Beware of this craigslist lawn care business scam. Do you have a couple of bucks burning a hole in your pocket and are you considering spending that money on a business you found in craiglist? You may want to reconsider that option after reading this discussion from the Gopher Lawn Care Business Forum, in which we hear from one entrepreneur who got burned when he bought what he thought was a thriving mowing business. 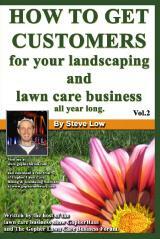 One lawn care business owner wrote “I recently bought a lawn care business from someone on craigslist. Since handing over my hard earned money, I found out he sold the business to 3 other people in my surrounding area. He was also running the scam in other cities in my state. With more research I found that charges were filed in court for 4 counts of theft. Whenever you are looking to buy a business online you need to beware or you might lose big like me. I had figured you could expect a drop in clients as soon as you buy a legit business simply because you’re not the guy they know and signed up with. In this case the guy claimed he had around 260 clients. I sent out letters saying that I’d be taking care of their account because he was moving and telling them what the new office number was going to be. A bunch of letters came back undelivered because that person doesn’t live there. But more alarming was that my answering machine was full of people saying things like, ‘I don’t know who he is…’, ‘My son mows my lawn…’, ‘He mowed my lawn last year a few times but we fired him for…’, ‘He owes me for services not performed…’. My answering machine was full of people who didn’t know the guy or weren’t using him. I also got a bunch of letters back saying similar things. The scammer worked in different ways. He learned from me that he couldn’t just sell the accounts. I put a $5,000 deposit down (I lost the least). After that I mailed all the ‘customers’ letters that said I’m the new owner bla bla bla. I got a bunch of people who said I’ve never heard of that business or that person before. My son, husband, another company etc. mows my lawn, we don’t use a lawn service. You name it I heard it over and over again. I had a performance clause in my contract that said if you lose more than x% then the deal is off. The seller never had 260 mowing accounts to begin with. I suspect he had more like 80. The other victims were scammed differently. I guess he realized that if he’s going to get more money, he’d have to drag it out so he can get the big payment. I can’t speak of their experiences but the scammer moved towards selling a partnership. I didn’t visit the 260 customers before paying him a down payment and that was my fault and the deal came with some crappy equipment. After he got my $5,000 he didn’t disappear. Amazingly enough, he is an ex-laywer so he tried to blame it on me and use his knowledge of the law to stay out of reach. He knew this would be a civil matter but that money came too easy, he couldn’t stop doing it. As luck would have it, the four of us met each other and when all of us presented the evidence the District Attorney said it wasn’t a civil issue anymore. You can even Google the guy’s name and see where he lost his license to practice law. He went from being a lawyer, to scamming people, to cutting grass, to scamming people again. No warning lights went off for me or any of his other victims during the sale process. Though when he told me he had the mowing routes memorized instead of written down that should of flagged me but the deal was so good that I thought he was just super disorganized. In my opinion the number of people he scammed trying to sell this ‘business’ is closer to 10 than the 4 that are in my case. I didn’t think that I could be that easily fooled. It makes me more comfortable to say the guy is a good con artist. I have since learned it is better, cheaper and you’re customers will be more loyal if you build your business one at a time. Throughout my life, I’ve bought several lawn companies and those customers that come along with them never feel like they are your customers. Many even regret you taking over. They’ll fade out at maybe a 50% rate in three years. Regardless of the story you tell someone, they want to be the ones making the decision. They don’t want you to take care of their lawn as a result of a decision they didn’t make. This seems to apply even if your work is better. A second lawn care business owner said “I don’t think I would consider doing a deal like that on CL but, who knows. If you consider this option you definitely need to look at all cash receipts over the last few years and if they don’t have them, tell them see ya. Bank records are a must as well. Speaking to the customers and finding out how long they have used the company’s services is big too. You need to find out if the customers under contract or is it just a verbal agreement? Lawyers need to be involved and not one for all, you need separate attorneys. From what I have seen, the terms requested are usually outrageous. Guys think that they are going to get someone to just hand over a large sum of cash just like that. I know guys that bought businesses and it worked out for them but you have to do your due diligence. You can not take anyone’s word that what they are selling you is the golden egg they are presenting. If you don’t take the time to investigate, you will be screwed because no one else is going to do it for you. An established business will have a paper trail you can follow. Knowing how long the customers have been customers can help determine if the business is worth buying too. Most entrepreneurs I have spoken to about this topic, over the years, have said it takes a long time to find the right business for sale and 99 out of 100 are garbage. Under the right circumstances it can be a big quick boost for a business. But it is like finding a needle in a hay stack. If all you are going to do is buy some slackers business, you might as well just put your money into advertising and build it up the old fashioned way. This entry was posted on Tuesday, August 18th, 2015 at 7:02 pm	and is filed under Business Failure, Customer Retention, Lawn Care Business, Lawn Care Contract, Lawn Care Customers, Marketing on Craigslist.com, Start up, Trials and Tribulations, buying customers. You can follow any responses to this entry through the RSS 2.0 feed. You can leave a response, or trackback from your own site.